Benefit Bidding has had the privilege of serving non-profit organizations in North Texas since 1990. Our clients are provided support and guidance throughout the entire planning process. Private and public schools, churches, foundations, booster clubs and other civic organizations have all benefited from our services. The Benefit Bidding team conducts auctions for groups of all sizes. In 2009, we added customized online auctions to our menu of services and changed our company’s name from Lloyd Cooper Auctioneers to Benefit Bidding. We understand your concerns. We have served as volunteer chairs for several fundraising auctions of various sizes – from school booster clubs to a gala for a national non-profit organization. 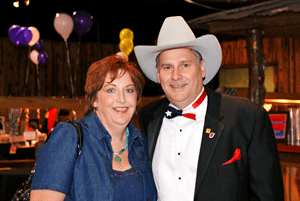 For each event, we (Lloyd and Mary) were responsible for comprehensive event development: volunteer recruitment, marketing, sponsorship and auction item solicitation, audience development, venue selection, event logistics…everything involved in creating a successful fundraising auction. We want to help you experience the overwhelming gratification which results from a successful fundraising auction. We are personally committed to helping every client achieve record-breaking results. You and your event team will reap a multitude of benefits from our experience, professional training, expertise, and unique fundraising strategies. Your organization’s mission is important. Financial support is essential to reach your goals. To encourage generous giving, you must create a bond between your cause and event guests. This is the key to acquiring new benefactors and planting the seeds for long term donor relationships. Audience members, whether at a live event or via online auction, must identify with your message. Benefit Bidding provides proven techniques for effective benefactor interaction. We have everything you need to run a successful fundraiser! Raise more $$ by adding an online auction to your next fundraiser! Add mobile bidding to your next gala event and watch your profits sour! If you have one of our supported merchant accounts then we can connect your auction site directly to your account. If not we also offer credit card processing services for your fundraising auction! Give us a call we have the best chanters in the business! Give us a call we are always here for you! Sell tickets for your event through you online auction site!